SHE, FROM PER POVERTY, CONTRIBUTED ALL SHE HAD. Our readings today offer us a glimpse into the world of the poorest of the poor who give all they have. In our first reading from the first Book of Kings (1 Kings 17:10-16), the prophet Elijah encountered a poor widow who shared with him her last meal, even as she and her son were about to die of famine. God rewarded her and her son with life. In those days, Elijah the prophet went to Zarephath. As he arrived at the entrance of the city, a widow was gathering sticks there; he called out to her, "Please bring me a small cupful of water to drink." She left to get it, and he called out after her, "Please bring along a bit of bread." She answered, "As the LORD, your God, lives, I have nothing baked; there is only a handful of flour in my jar and a little oil in my jug. Just now I was collecting a couple of sticks, to go in and prepare something for myself and my son; when we have eaten it, we shall die." Elijah said to her, "Do not be afraid. Go and do as you propose. But first make me a little cake and bring it to me. Then you can prepare something for yourself and your son. For the LORD, the God of Israel, says, 'The jar of flour shall not go empty, nor the jug of oil run dry, until the day when the LORD sends rain upon the earth.'" She left and did as Elijah had said. She was able to eat for a year, and he and her son as well; the jar of flour did not go empty, nor the jug of oil run dry, as the LORD had foretold through Elijah. 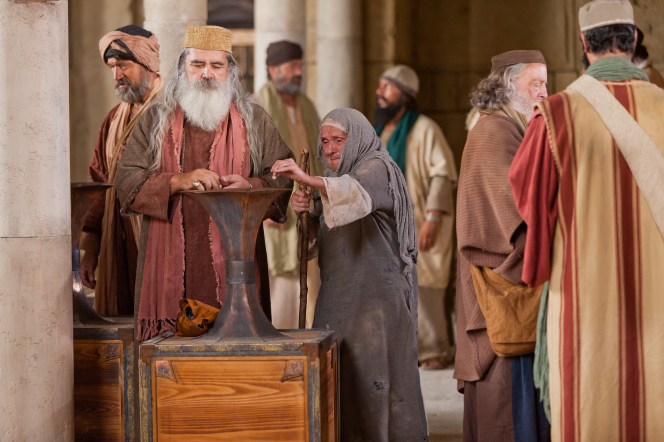 In our Gospel reading (Mark 12:38-44), we hear of another poor widow who gave to the temple treasury everything she had, two small coins. This, in contrast to the rich people who gave large sums out of their surplus wealth. Jesus called attention to her as a model for us. In the course of his teaching Jesus said to the crowds, "Beware of the scribes, who like to go around in long robes and accept greetings in the marketplaces, seats of honor in synagogues, and places of honor at banquets. They devour the houses of widows and, as a pretext recite lengthy prayers. They will receive a very severe condemnation." He sat down opposite the treasury and observed how the crowd put money into the treasury. Many rich people put in large sums. A poor widow also came and put in two small coins worth a few cents. Calling his disciples to himself, he said to them, "Amen, I say to you, this poor widow put in more than all the other contributors to the treasury. For they have all contributed from their surplus wealth, but she, from her poverty, has contributed all she had, her whole livelihood." In our Epistle reading (Hebrews 9:24-28), we hear a continuation of the Letter to the Hebrews from the past few weeks. In it, we hear the continuing contrast between Jesus, our eternal high priest, and the earthly high priests of old. They entered a man-made sanctuary, Jesus enters into the presence of God on our behalf. They offered imperfect sacrifices, first for their own sins, then for others. Jesus, the unblemished lamb, offers the perfect sacrifice - himself. They offered continual sacrifices, Jesus offers himself once, for all people, for all time. Just as Jesus offered everything he had to give, his very self, in sacrifice for our sins, so to, our two widows in today's readings offered everything they had in sacrifice to God. We are called to emulate that spirit of sacrifice - not from our surplus wealth but from our poverty. What is it we are poorest of? Perhaps, that is what we are called to give.